The Union Iron Works of San Francisco constitute one of the great industrial institutions of the world, and one which should be a source of genuine pride to every patriotic Californian. These works are located at Potrero Point, on Napa Street, and cover nine blocks, or an area of twenty-two acres. They are connected with the tracks of the Central and Southern Pacific railroads, and through them with the entire railroad systems of the United States and Canada. In appliances and facilities they are equally as well (if not better) fitted up as any establishment of the kind on the American continent or in Europe. Within their walls are the largest boring mills, hydraulic presses, planing machines, riveting machines, shears, hydraulic flanging and forming machines to be found in the world; overhead cranes, to handle the work in course of construction, cars, track and turn tables for facilitating the handling and movement of heavy pieces; buildings fire-proof, well lighted, well ventilated; all the doors operated by hydraulic machinery. The establishment is divided into a number of departments, each one of which is an industrial world in itself. There are the machine and erecting shops, which are comprised within a large brick building of 200x215 feet, built with a gallery 150 feet long and 50 feet wide. All this is under one iron roof, and is divided by cast-iron pillars into five compartments, in which are large and small traveling cranes, operated by compressed air and hydraulic machinery, and also the general running machinery usually employed in the working of metals. The same building contains the offices, reception and consultation parlors, etc., necessary to the conduct of such a great enterprise. The foundry is enclosed in a brick building 100x200 feet, and has a floor surface of 2,000 square feet. The principal molding pit is 14 feet in diameter and 14 feet deep. It can be utilized for making the very largest castings. There is a second pit 9 feet in diameter by 10 feet in depth. There are four core ovens, with the most approved apparatus for heating and lifting. The largest of these ovens is 18 feet square, and is capable of drying a 20-ton core in a very short time. The foundry is equipped with a 60-ton traveling crane, and has three cupolas, with a capacity which renders them equal to the task of making a 60-ton casting in three hours. All the other appliances, including grinding machinery, clay and sand pulverizers, cinder barrels, etc., are of the latest and most approved kind. The pattern shop is a four-story brick building 50x150 feet. The three upper stories are devoted to the storage of patterns, the lower one to making patterns. This shop is supplied with the latest of modern machinery for planing, sawing, turning, mitering, gear-cutting, molding, etc. There is here carried out the most perfect system of registering, so that any patterns, once made, can be found at a moment’s notice. A large four-storied storehouse is filled with all the supplies used in such a vast concern. The delivery system in this auxiliary is perfect and insures the strictest economy on the part of the army of artisans employed in these vast works. To this economy and care this establishment’s pronounced commercial success and capacity for profitable undertaking work at the lowest prices is largely ascribable. The boiler shop covers a space of 200x150 feet, and fitted throughout with the most perfect hydraulic machinery. It is said to be one of the largest and most complete establishments of the kind in the world. Its appliances include bending machines, rolling machines, planing machines, shears, punches, etc. Attached to the woks is a shipbuilding yard of comparatively recent origin, which, close observers think, is bound in a little time to become one of the principal places of its kind in the world. It is supplied with every facility, and has already turned out the very best quality of work at the very lowest prices. Take them all in all, these Union Iron Works constitute a marvelous establishment and contribute largely to the industrial prosperity of San Francisco. Few San Franciscans have any idea of their vastness or capacity. 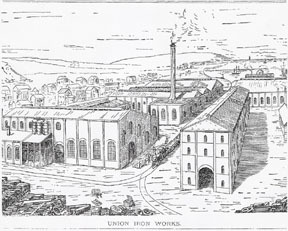 The Union Iron Works built the Con. Virginia and California mills, Virginia City; the International mill, White Pine; the Ontario mill, Utah; the Drum Lummon mill, Montana, and supplies pretty much all the mining machinery for the coast. Its latest great exploit in this direction was the erection of the Candelaria Milling Works, which are said to be one of the grandest examples of modern mechanism.